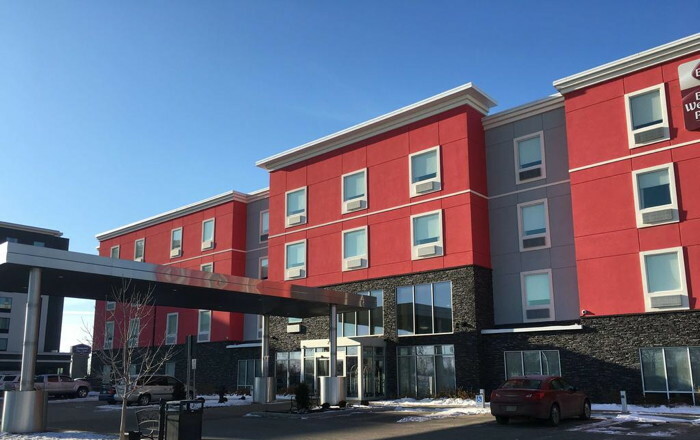 Best Western Hotels & Resorts announced the opening of the Best Western Plus Airport Inn & Suites, located at 317 Areogreen Cres near John G. Diefenbaker International Airport in Saskatoon. Owned by John Owens, President of Owens Hospitality Group Ltd, the hotel features 80 guest rooms, including 20 suites. Following $500,000 in renovations, the newly updated hotel includes a range of amenities that are sure to please today's travelers. Amenities include a cocktail lounge to unwind with friends, family or colleagues, an indoor heated pool and fully equipped fitness center. Perfect for those longer stays or travelers who just don't want to eat out, every room is equipped with a full kitchen featuring full-size refrigerators, a microwave, dishwasher and cooktop. There's also no need for guests to leave man's best friend at home with available pet-friendly rooms. "We are delighted to open the doors of our newly renovated hotel as a part of the Best Western Hotels & Resorts family," said Leslie Hrehirchuk, General Manager, Best Western Plus Airport Inn & Suites. "The Best Western brand is known for its superior customer service, and the company's recent brand refresh and continued dedication to providing innovative solutions align perfectly with our staff's commitment to creating memorable stays for our guests." While guests are just minutes away from John G. Diefenbaker International Airport with a complimentary airport shuttle, the Best Western Plus Airport Inn & Suites also provides easy access to Midtown Plaza, SaskTel Centre, Dakota Dunes Casino, Wilson Entertainment Park and Saskatoon's central business district. Are you with Best Western? If you are a member of Best Western you may be interested in learning how to optimize your content on our network.